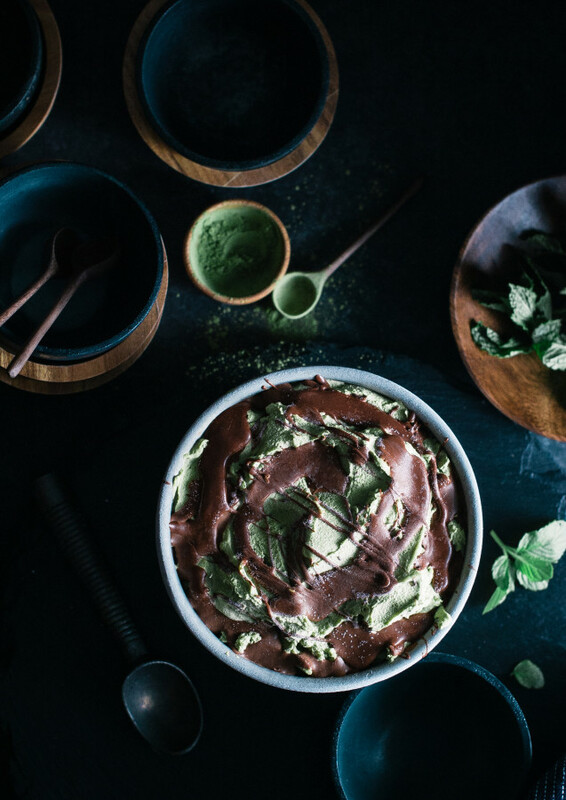 *This Matcha Avocado Mint Chocolate Mousse Swirl Ice Cream is free of refined sugars and diary, and is vegan. I’ve partnered with Uncommon Goods to share this recipe with you in the most beautiful and functional serve ware! Uncommon Goods offers sustainable, handmade, and organic products that are as lovely as they are good for the environment. Visit Uncommon Goods to learn more. Making really delicious, creamy dairy ice cream can be a bit of a challenge. When you take out all of the cream and milk and replace it with coconut milk instead, you lose those milk fats that make ice cream so creamy and dreamy. As it happens, I have a special secret to avoid an icy, cream-less ice creams. 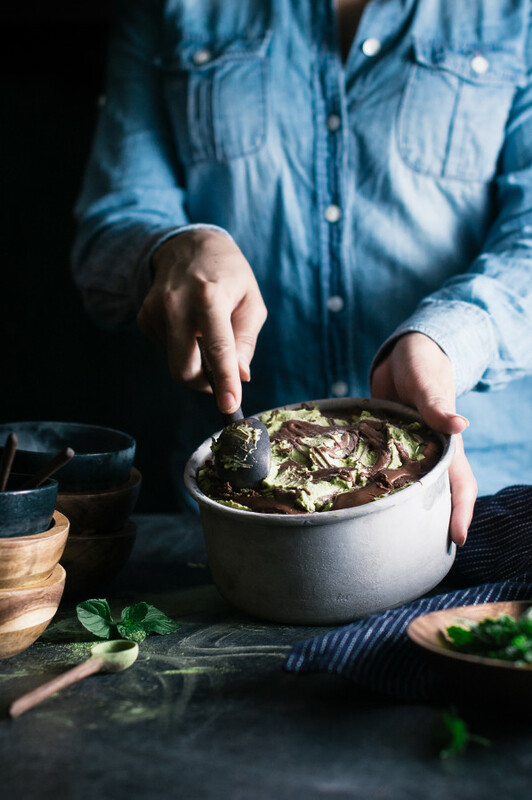 Avocados add creamy fats back into the ice cream and leave the texture of the ice cream thick, luxurious, and just as, well, creamy as conventional ice cream. Now, I suppose that you can’t add avocados to every flavor of dairy free ice cream. I don’t think, say, a lemon ice cream would be quite as appealing with a green tint and slight avocado flavor, but avocados blend seamlessly into stronger flavored and darker colored ice creams like chocolate, coffee, and mint. 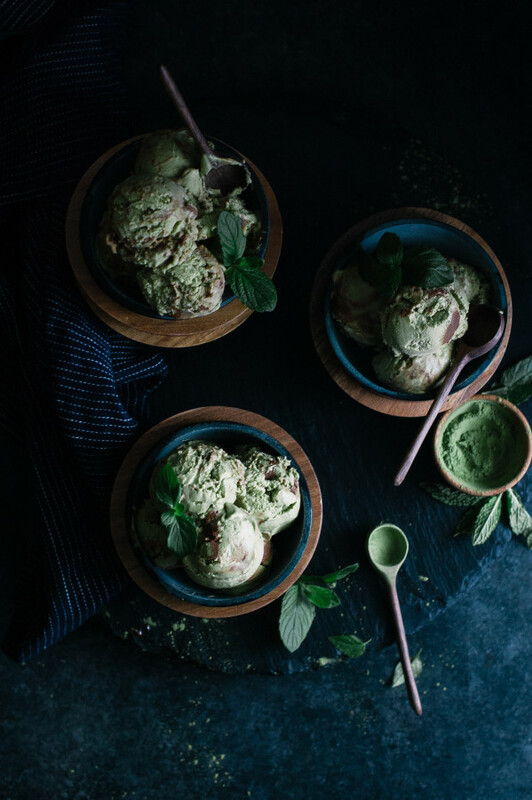 This Matcha Avocado Mint ice cream is perrrrrrfect for using avocados. Matcha and mint are already one of my favorite flavor combinations and avocado slides in right along side them like a younger sibling. 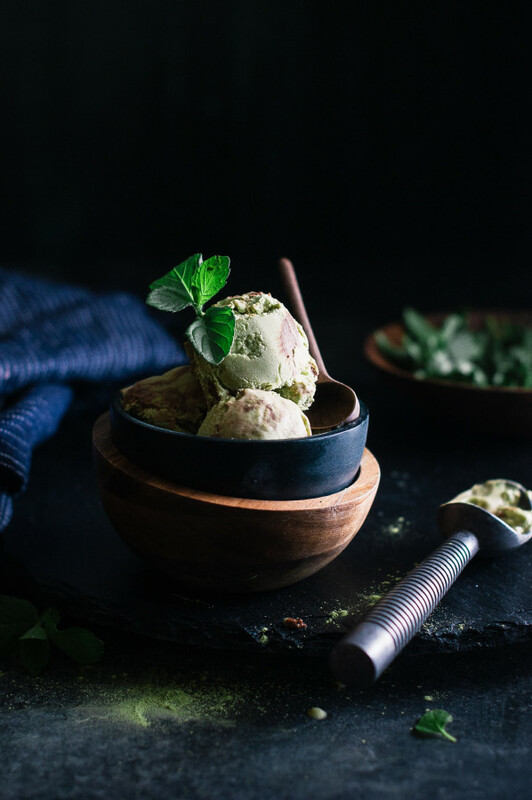 The three blend together to make an incredible fresh and earthy mint ice cream. 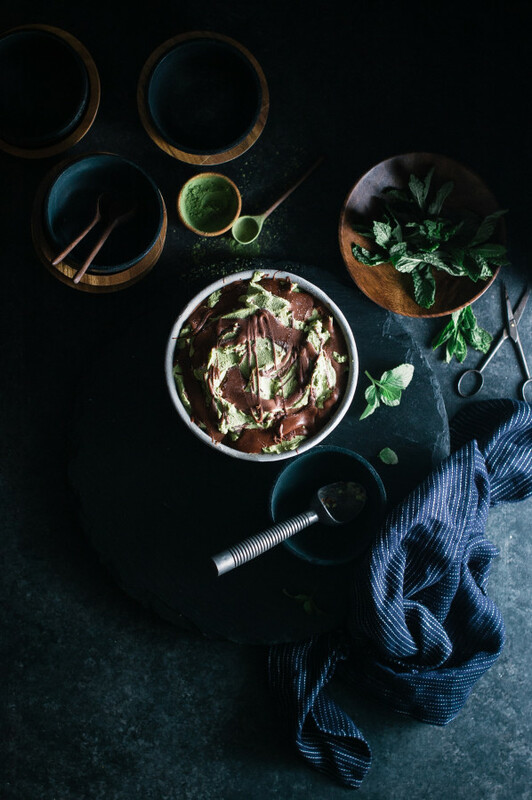 Chocolate, of course, is a necessity in mint ice cream. Well, for me anyways. Instead of chocolate bits, I swirled this ice cream with silky rivers of chocolate mousse. 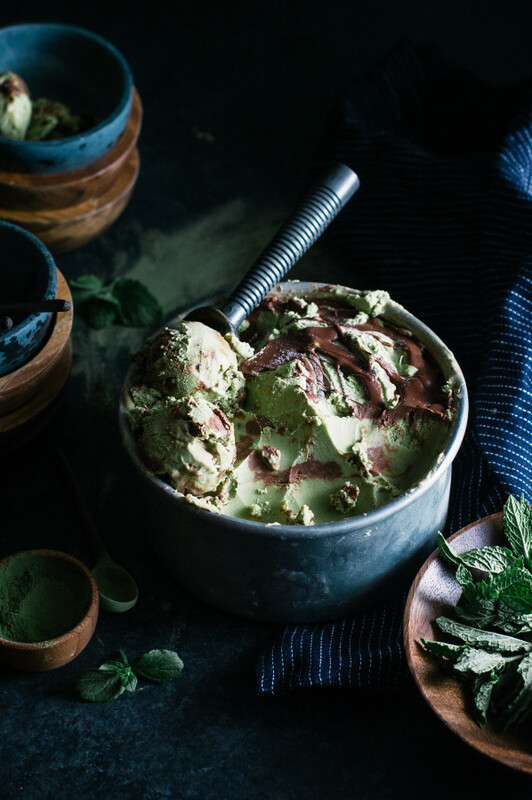 The mousse becomes melty and creamy, just like the mint ice cream, so it all melds together in one sweet, fresh, earthy ice cream with slightly bitter notes from the chocolate mousse swirls. I’ve recently discovered that there is only one thing better than a big bowl of ice cream and that would be a big bowl of ice cream that doesn’t start melting the second the scoops hit the serving dish. These soapstone bowls from Uncommon goods were made for keeping ice cream cold…for as long as it takes to eat, at any rate. The soapstone bowl is separate from the wooden bowl. Pop the soapstone portions in the freezer for a few hours(or simply store them there for cold bowls whenever the need arises) and when it’s time to dish up ice cream, place them back on the wooden bowls and scoop up your ice cream! 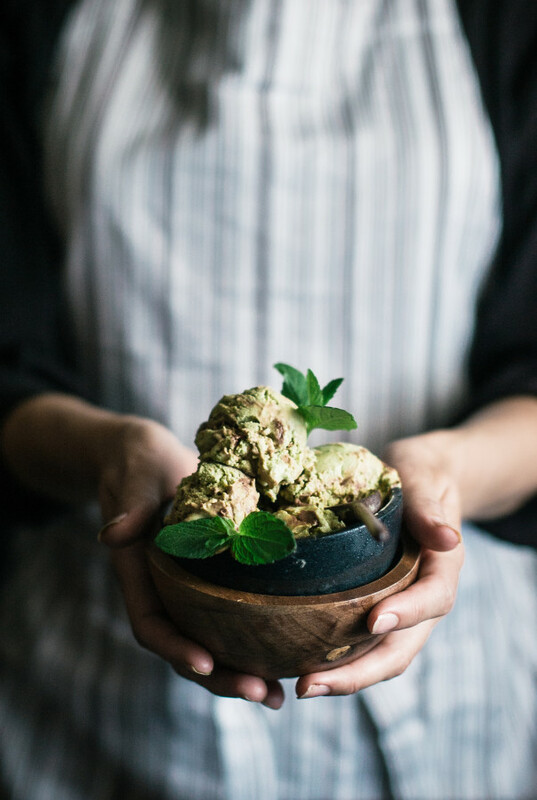 Your hands stay comfortable, thanks to the wooden bowls, and your ice cream stays frozen, thanks to the soapstone bowl. For someone who makes ice cream as much as I do, you could say I’m more than a little obsessed. Wouldn’t these bowls make the perfect Mother’s Day gift? 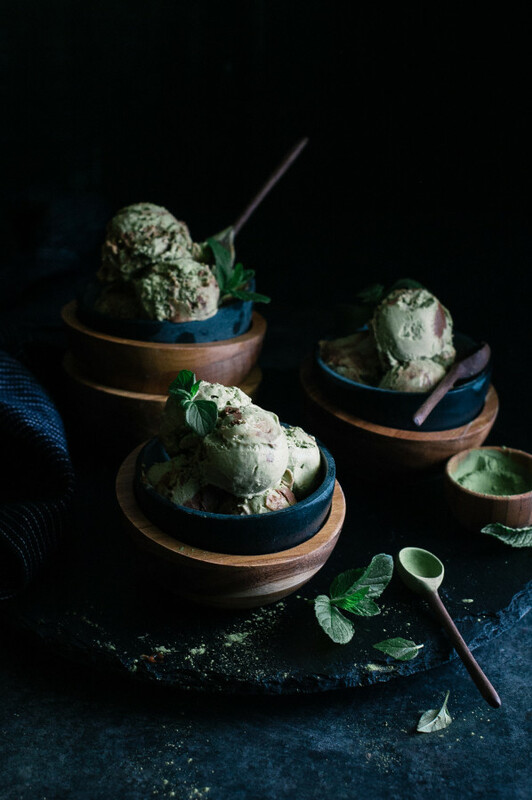 *Keep in mind that because this ice cream contains avocados, it will brown after being left out and exposed to the air. Not that you’ll be able to eat it slow enough to see it happen. Just an FYI. *Do not leave the vodka out of this ice cream. If you don’t add the vodka, the ice cream will freeze very hard and be difficult to scoop out. Since alcohol does not freeze, if will help the ice cream to not freeze to a rock solid consistency. You won’t be able to taste it, or tell that it’s in the ice cream, but it makes a big difference in texture. This post is a collaboration sponsored by Uncommon Goods. Place the coconut milk and tapioca starch in a small saucepan. 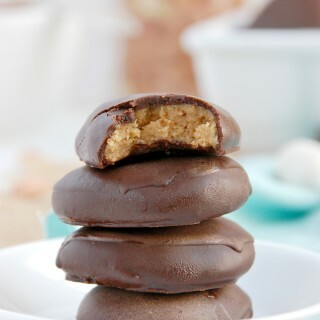 Whisk together until smooth and lump-free. Heat on medium/high, whisking occasionally, until mixture comes to a boil and thickens. Remove from heat and cool completely. Pour the mixture into a high speed blender and add the coconut cream. Place the mint leaves in a large fine mesh sieve and pour the boiling water over them until the leaves have wilted slightly. Lightly press the moisture out of the leaves and add them to the blender along with the avocados, matcha powder, peppermint oil, maple syrup, coconut oil, vanilla, vodka, and salt. Blend on high speed until mixture is silky smooth and mint leaves have broken down to the point that you can no longer see them. NOTE: if your blender is not powerful enough to completely blend the mint leaves, run the mixture through a fine mesh sieve to remove mint leave pieces. Place the mixture in the fridge until chilled completely. 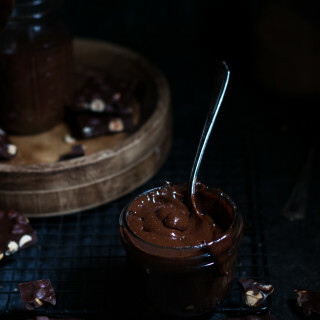 Place the chocolate chips and coconut oil in a small saucepan. Heat on medium heat, stirring occasionally, until the chocolate chips are melted and mixture is smooth. Remove from heat and whisk in the coconut milk. Set aside while you freeze the ice cream. Remove the mint ice cream base from the fridge and freeze in an ice cream maker according to manufacturers instructions. Freeze a loaf pan or other container while the ice cream freezes. When ice cream has frozen, scoop out ⅓ of the ice cream into the prepared container and spread evenly across bottom. Drizzle ⅓ of the chocolate mixture over the ice cream. Spread another ⅓ of the ice cream over the chocolate drizzled layer. Drizzle another ⅓ of the chocolate mixture over that layer of ice cream. Spread the remaining ice cream over that chocolate drizzled layer and drizzle the remaining chocolate over the top of the ice cream. Cover with plastic wrap and let freeze completely. TO SERVE: Pull ice cream out of the freezer 15 to 20 minutes before scooping. 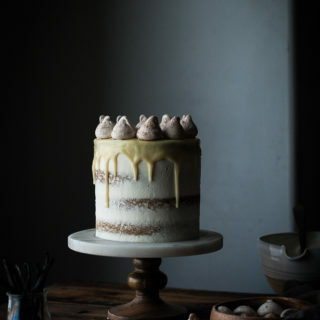 Vanilla Bean Butter Cake + White Chocolate Mousse & a 3 Year Blogiversary!